Harper Collins, 2017. 322 pages. 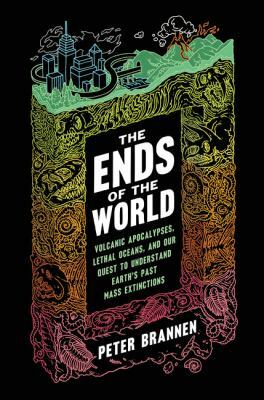 Fossils, asteroids, and geology have never been so entertaining as in Peter Brannen’s The Ends of the World. In this culmination of extensive research, award-winning science journalist Peter Brannen explains each of the five major extinction events of Earth’s geologic history. Everyone is familiar with the giant asteroid responsible for the death of the dinosaurs, but that was just one in several instances in the past 500 million years that virtually all life on our beloved planet has come to a dead end. Brannen not only describes the causes and effects of each global disaster, but also what life was like in these previous worlds completely foreign to our modern day. In these pages, you’ll encounter dragonflies the size of large birds, giant armored fish with guillotine mouths, flying reptiles the size of small airplanes, and much more. Brannen also explains, in his witty and accessible prose, why all of this information is relevant to us today. Asteroids are a popular harbinger of Armageddon, but in reality climate change has a far more devastating track record. Scientists today study the past extinction events as a means of understanding what is in store for our planet if humans continue to rapidly release so much carbon dioxide into the atmosphere through fossil fuel consumption. Ocean acidity from climate change has already destroyed 30 percent our ocean reefs, and humans are currently responsible for the extinction of countless species. Could we now be living in the Earth’s sixth extinction event?